British playwright Terry Johnson’s “Hysteria” won the 1994 Olivier Award for Best Comedy. Judging from the current Canadian Stage production of the play, 1994 was not a good year for comedy. Given the excellent cast and the highly imaginative production design, the blame for the unsatisfying impression the play makes must lie with the playwright and the director. In 1994 Tom Stoppard won the Olivier Award for Best Play. Compared with “Hysteria”, “Arcadia” is by far the richer, more assured work. While Stoppard had moved on, Johnson’s play harks back to Stoppard’s “Travesties” of 1974 as its model. Both plays concern the meeting of famous men outside of their native countries—James Joyce, Tristan Tzara and Lenin in Zurich for Stoppard, Sigmund Freud and Salvador Dalí in London for Johnson. In both plays the action of another play influences what we see on stage—“The Importance of Being Earnest” for Stoppard, the 1929 Ben Travers farce “Rookery Nook” for Johnson. It is, therefore, hard to credit Johnson with a very original conception. Much of the play seems like imitation Stoppard with a significantly lesser amount of wit per line. The play deals with a day in 1938 after Freud had moved to London and was dying of cancer of the jaw. Before a word is spoken his doctor gives him an injection of morphine to ease the pain. The action begins with an extended and not very engaging section in which a young woman appears, demanding to speak to Freud without revealing what she came to say. When Freud relents after much argument and she impersonates a former patient of his, “Rebecca S.”, he loses all patience with her. She tries to embarrass Freud by disrobing, only to be hurried into the closet when Freud’s doctor, Abraham Yahuda, arrives. He is furious that Freud intends to publish the tract “Moses and Monotheism”, which Yahuda says will undermine Judaism as the worst possible moment. Finally, Salvador Dalí enters to pay homage to Freud the honorary founder of Surrealism for his work on the unconscious. At this point the play shift gears into pure farce with Dalí and the woman in various states of undress chasing each other about the room and with Freud attempting numerous feeble lies to explain these goings-on to his doctor. After the doctor exits, the play shifts into a very serious mode, lightened only weakly by Dalí’s comments. The woman reveals that she is Jessica, the daughter of “Rebecca S.” Her mother was cured when Freud still held to his belief that hysteria was caused by suppressed memories of childhood sexual abuse. However, when after 1897 Freud abandoned that theory in favour of infantile sexuality, her mother felt abandoned and betrayed and ended her life in a mental institution. Jessica holds Freud directly responsible and wants to know why he abandoned his theory. The elements of bedroom farce that Johnson introduces with Dalí don’t mesh at all well with the very serious subject matter of Freud’s cancer, his undermining of Judaism or the renouncing of his earlier views on hysteria which have driven a woman to madness and suicide. Nor do they accord well with the graphic descriptions of the sexual abuse of children or the horrors of the German bombing of London. Johnson’s excuse is that Freud and Dalí have both seen “Rookery Nook” and that what we see is Freud’s surreal morphine-induced dream free-associating these events. Unfortunately, Johnson’s dramaturgy is far too plodding and director Morris Panych’s direction not fluid enough to overcome it. As it is, although Dalí is the main source of humour in the play, his appearances always seem like unwanted distractions from the unfolding of Jessica’s story. While in Stoppard farce communicates serious ideas as, in Johnson farce seems to interrupt and trivialize them. In fact, except as comic relief, it’s difficult to know why Dalí is in the play at all. The only parallel is that Freud punctures Dalí’s belief in Surrealism just as Jessica tries to puncture Freud’s belief in infantile sexuality. Panych does not overcome these difficulties in the script. Indeed, under his direction this “shocking, yet wildly funny comedy”, as CanStage bills it, hardly seems like a comedy at all. While we are riveted by Jessica’s story, the episodes of farce surrounding Dalí garner only half or fewer of the laughs they aim at (at least at the final preview performance I attended). There may be a way to have the play slide into and out farce as the surreal set-up would suggest, but Panych does not manage it. The cast do their best with the material. Eric Peterson as Freud and Kristen Thomson as Jessica seem far more comfortable with the serious rather than the farcical elements of the play. David Storch as Dalí and Peter Donaldson as Yahuda remain respectively comic and serious throughout. Peterson does very well at impersonating the founder of psychoanalysis, but becomes difficult to hear when he moves to the back of the stage. In many ways it is Thomson’s fierce intensity as Jessica that makes us unwilling to switch into the farcical mode, but such intensity is what the script demands. Considered in isolation, Storch’s Dalí is a very funny caricature though his heavy Spanish accent fades as the play progresses. If Dalí is meant as a counterpoise to Jessica, the strategy doesn’t work since we are naturally more drawn to a character than a caricature. Yahuda is a thankless role for someone of Donaldson’s calibre, Johnson having given him little of interest to do. Three other actors—Andrew Bunker, Roxanne Deans and Adam Pettle—appear as non-speaking figments of Freud’s imagination in the surreal dénouement. The most imaginative aspect of the show is Ken MacDonald’s marvellous design. The off-white walls of Freud’s study consist entirely of floor-to-ceiling built-in filing cabinets with a huge rolling library staircase to get at them, making the study seem also like an asylum. All the characters, save the black-clad DalíDalí, are clothed in tones matching the walls. Does this mean the most eccentric of the four is the sanest? Paul Mathiesen provides the admirable lighting. The show begins with projections of titles by Arash Vakili accompanied by agitated music as if we about to see one of Hitchcock’s many films dealing with abnormal psychology such as “Vertigo” or “Spellbound”. The show concludes with a complex projected montage of Nazi soldiers, concentration camp inmates and a staring eye. In themselves both are well done, but neither suggests that what we are about to see or have seen is a comedy. All in all, “Hysteria” struck me as a feeble attempt at a comedy of ideas that, unlike Stoppard’s “Arcadia” or even Steve Martin’s “Picasso at the Lapin Agile”, leaves one with little food for thought and little reason to laugh. 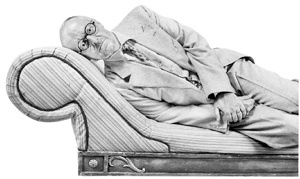 Photo: Eric Peterson as Freud. ©2000 Canadian Stage Company.